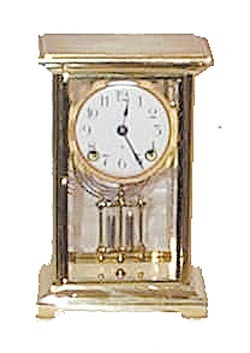 Ansonia Clock Co., miniature crystal regulator, "Dorval", ca 1914. The little fellow is only 8 7/8 inches high, nice polished brass case. Near mint except for top where some of the finished was polished down close to the metal. 1 piece porcelain dial is signed, 4 perfect beveled glasses. 8 day movement, strikes a hanging gong, running. A mint simulated mercury pendulum. 1 small flaw-the knob is missing on the back door. Timesavers should have one in stock. This may be the best little crystal regulator I have seen. Ly-Ansonia No.375.